After extensive south of 70 research of Ohio’s bountiful selection of donuteries I finally had an opportunity to start exploring what Northeast Ohio has to offer. What I describe for you next may sound like a fantasy – but it did indeed happen. On my way to the Ohio Craft Brewers conference in Ohio City I had a little downtime and decided to check Jack Frost off of my list. The place had come in as a reader suggestion and in several online searches. I’m glad I made time for donuts. Well let’s be honest, I’m almost always glad to make time for (good) donuts. The first thing that Jack Frost has going for it is how conveniently located it is to Ohio City (which is the best square mile of food and beer in Cleveland). Located on Pearl Road, it only took a few zigs and zags through neighborhood streets to get back on track on Pearl Road and more tasty treats after I left the parking lot. The next plus, was close proximity to a windmill. Yes, nothing panics me more when looking for a new place than not having some easy to find landmark as a reference point in case I decide to drop in on a whim in the future. A windmill is an easy thing to remember. The next thing that made me feel warm and fuzzy before I pulled in to the parking lot was the exterior. A bit beat up, weathered and industrial, this was no foo-foo donut shop, Jack Frost was clearly an old school neighborhood hangout. Confidence was high for scoring a classic donut before I walked through the door. I was worried as well. It was past 3:30 pm on a Tuesday and I was concerned that the cupboard might be close to bare (they frequently sell out). Fortunately, the shelves were packed with too many choices (Jack Frost was conveniently open to 8 pm) and ready to fill boxes for people heading to 2nd shift jobs or heading home. In fact, there were so many choices I was overwhelmed. Also adding to the pressure, this was my first trip into Northeast Ohio Donut research and I had just found out the place was voted best of Northeast Ohio (competing against more than a baker’s dozen other donuteries) the desire to get one of each was squelched by the fact that they had 35 – 40 different varieties ready to serve and I still had three breweries, Mitchell’s Ice Cream and a Mansfield Pizza place to visit (as well as some possible random stops) before I was call the day done. So I opted for eight different donuts to try. This was quite a Sophie’s choice – trying to decide on which donuts would go home with me, knowing it may be months or years before I would be back. I opted to go with: Salty Carmel, Maple Bacon, German Chocolate, Blueberry, glazed, Raspberry, Maple with peanuts and Peanut Butter cream. Oh, My, Goodness they were good. The kind store clerk also threw in a couple of complimentary donut holes as well, she mentioned they were a fan favorite and based on my (many, many) questions, she figured I might appreciate them. The first thing I noted about the donuts is that they are just a bit smaller than the typical donut. However based how the massive amount of toppings and extras piled on to each, I felt no reduction of value, if anything the smaller donut may be a public service, in theory, less bulk could mean more consumption. Their cake donuts (my preferred style) were light and fluffy but sturdy enough to bear the weight of the toppings. I picked up two blueberry donuts for Mrs. Gourmand since it is her favorite donut variety and her litmus test for donut quality. She liked the blueberry flavor in them but still gives DK Diner the nod for best in (Blueberry) show. The absolute best of what I sampled was the German Chocolate donut. It was full of rich flavors in both the donut, the German Chocolate base and the regular chocolate intermixed in the frosting. This was exceptional. 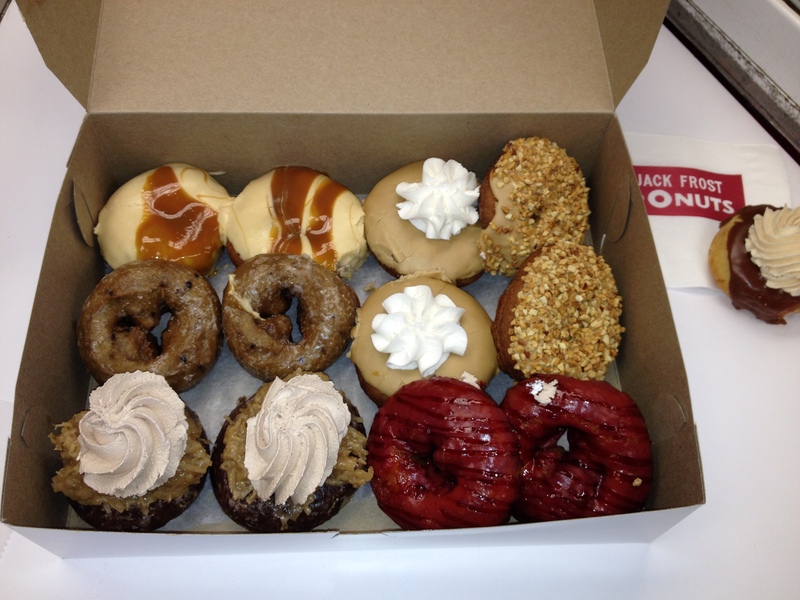 A close second was a tie between the peanut butter donut and the salty caramel. 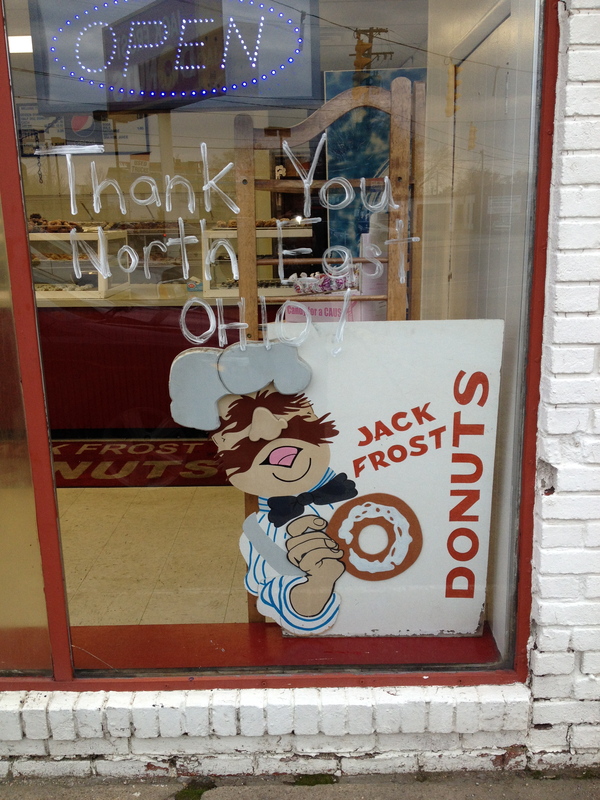 Jack Frost has been in the business since 1937. I do not think the business has had the same family of owners for the entire history but whatever has been handed down during the decades is impressive. The base donuts are old school good – simple and true to style. The flavor combinations are much more modern, riffing off of what gourmet cupcake places wanted to be but typically did not deliver on during the cupcake crave bubble of the early 21st century. If cupcake places had the flavors of Jack Frost with the prices to match – they would be as ubiquitous as Starbucks. If you are heading to Cleveland or nearby, this place is well worth a small detour. Note: By report their Paczki are legendary resulting in the need for a tent and pre ordering during Easter time. This entry was posted on November 27, 2014 at 8:27 PM	and is filed under bakery, CLEGourmand, donuts, Ohio, Ohio Donut Trail, Road Trip. 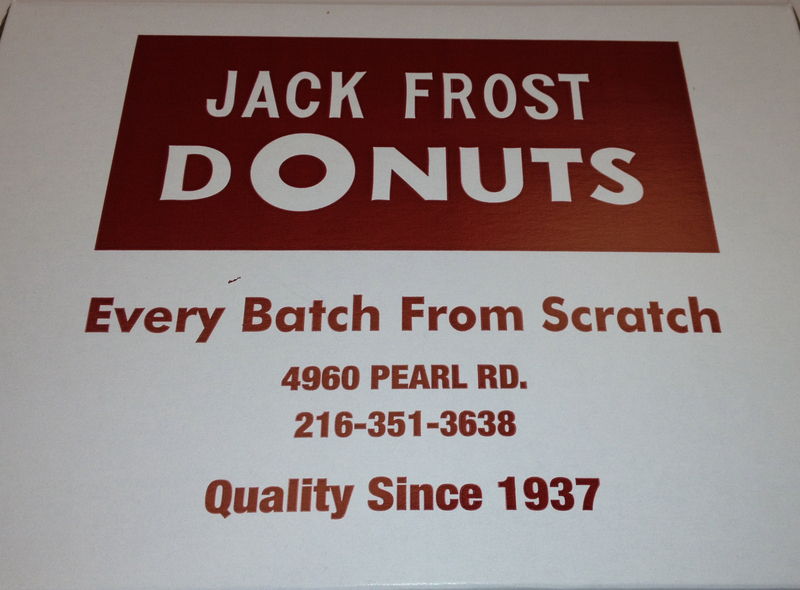 Tagged: Jack Frost Donuts. You can follow any responses to this entry through the RSS 2.0 feed. You can leave a response, or trackback from your own site. So happy you made it there. The first time I went there, we got some donuts to bring home and my wife brought a donut to my mouth so I could take a bite. I immediately had to pull over into a nearby parking lot so that I could get a second and third bite. Delicious (and super rich). Now I want to go back. Thank you for checking us out! Hope you can come back soon. Thank you for the wonderful comments about the shop and experiencing our donuts first hand.